Ground Control is a microgame in the WarioWare series. It first appears under the name Paper Plane in the Strange folder in WarioWare, Inc.: Mega Microgame$!, and later in WarioWare Gold. The original microgame also has a "full" version in Mega Microgame$!, also titled Paper Plane. 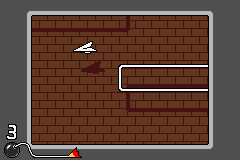 In WarioWare, Inc.: Mega Microgame$!, there is a paper plane flying from above in some sort of building, and barriers sticking out from either wall. The player must use the control pad to steer the plane around the obstacles. Hitting one of the obstacles will destroy the plane, losing the game. 1st level difficulty: The obstacles are very thin. 2nd level difficulty: The obstacles are twice the size. 3rd level difficulty: The obstacles are three times the size, making them very thick. In WarioWare Gold, while keeping its original gameplay, the microgame received a thematic overhaul. 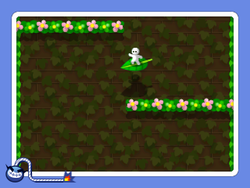 Instead of a paper plane, the player controls a small, white character gliding on a leaf down a flowery well. If they crash into a wall, the character becomes a sapling as a winged halo flies away. This page was last edited on April 10, 2019, at 22:10.